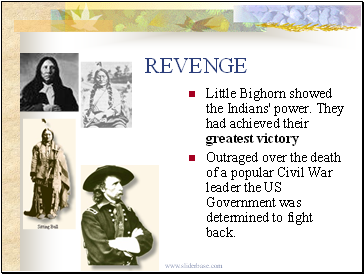 In late 1875, Sioux and Cheyenne Indians were angered at the whites travelling into their sacred lands in the Black Hills. To avoid disputes with the Indian tribes the U.S. Govt. Made treaties to recognize Indians rights to most of the Great Plains. 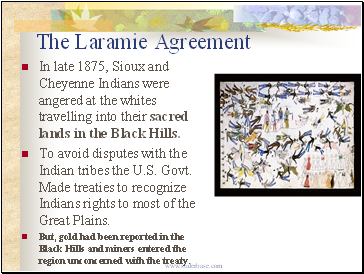 But, gold had been reported in the Black Hills and miners entered the region unconcerned with the treaty. 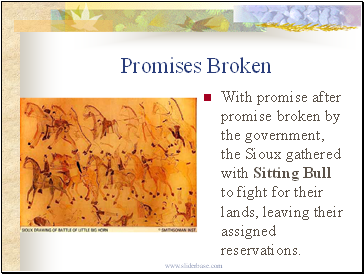 With promise after promise broken by the government, the Sioux gathered with Sitting Bull to fight for their lands, leaving their assigned reservations. To force the large Indian army back to the reservations, the Army sent Lt. 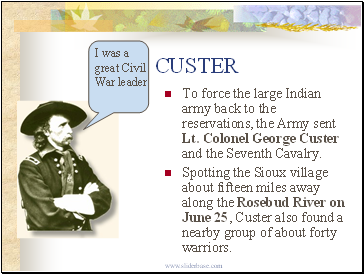 Colonel George Custer and the Seventh Cavalry. Spotting the Sioux village about fifteen miles away along the Rosebud River on June 25, Custer also found a nearby group of about forty warriors. 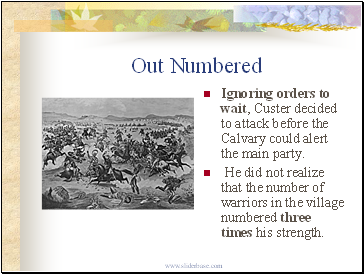 Ignoring orders to wait, Custer decided to attack before the Calvary could alert the main party. He did not realize that the number of warriors in the village numbered three times his strength. 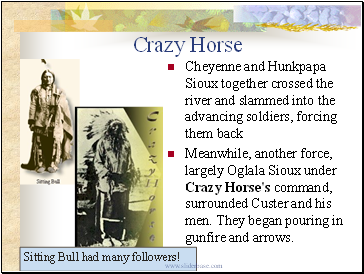 Meanwhile, another force, largely Oglala Sioux under Crazy Horse's command, surrounded Custer and his men. They began pouring in gunfire and arrows. Sitting Bull had many followers! 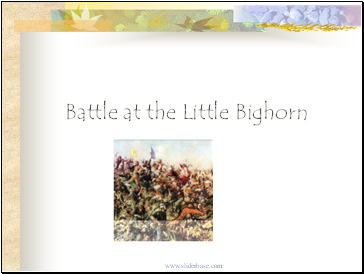 As the Indians closed in, Custer ordered his men to shoot their horses and stack the carcasses to form a wall, but they provided little protection against bullets. 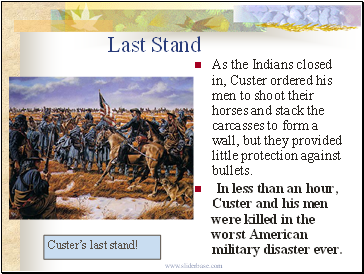 In less than an hour, Custer and his men were killed in the worst American military disaster ever. Outraged over the death of a popular Civil War leader the US Government was determined to fight back.